I was going through my cookbook shelves this morning, looking for a recipe I use to make quite a bit when I was the dessert chef at Campagnola- Tiramisu. I remember when I first made this recipe for the owner and head chef to try. I'd spent all morning preparing it then brought it down to the main kitchen to watch it disappear within seconds while the kitchen boys were left with moustaches of cream and sticky fingers to lick. I managed to save a couple of slivers for Steve and Vince to try and to get the go-ahead. I think it was a restaurant favourite but not quite as popular as the sticky date....but what is? I was first shown this tiramisu recipe when working for the restaurant Zartowa, in Melbourne. Anthony was Head chef and always loved teaching new dishes to anyone who showed an interest. From the first time I made this I have never made tiramisu any other way. I know it works beautifully, looks insanely good when plated and tastes fantastic so why change? (as you can see from the picture it has had a lot of use- Nic seems to think it rich of me to even call it a book!) and opening up to the page where the recipe was waiting for me I could of kicked myself. It is pretty typical for a chef to write, scribble or jot down words and numbers and call it a recipe. If it's a recipe used often then nine times out of ten you are just trying to jog your memory looking at the chicken scratch I happened to call a recipe all those years ago! Yeah well, news flash! My memory isn't what it use to be! What was the temperature? How long do I bake it for? Method......?????? Damn you brain! Anyway I decided to try a bit of memory power and figuring out if it was a 2 or a 5 I wrote down all those years ago. I am happy to report I think I did OK. I have always been a hopeless theoretical person. Terrible at any type of exam, hopeless at spelling and couldn't remember a sequence of numbers five minutes after being told. I am however, very good at remembering movements, tactile events, flavours and faces of interest. OK so confidence was high but I was a bit annoyed at myself for putting it in a thin tray. 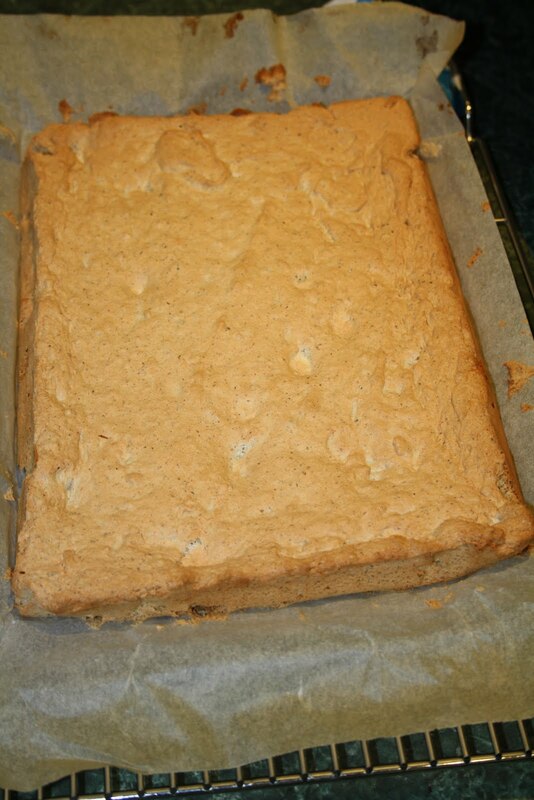 After pulling it out of the oven I couldn't remember the sponge being this high before. I soon got over my annoyance when I started soaking it in a couple shots of coffee, thick chocolate sauce and Frangelico for a flavour sensation! 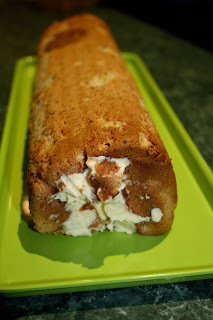 Once the marscapone is added I was home and hosed, all I needed to do was roll it up into a log. 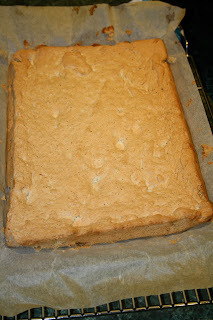 Because my sponge was thicker than usual it didn't roll as I would of liked but all was not lost. It still looked like a log so I tightened the end of the greaseproof paper and popped it in the fridge for half an hour to let it set and firm up while I finally took a shower (surely I am not the only person to get up early and start baking in my dressing gown?). Just before I put the final layer on (cream), I took the grease proof paper off and placed it on a platter long enough to hold the tiramisu in one piece. The log feels firm, stable and ready for the whipped cream. I lightly sprinkled on some cocoa powder, cover it with glad wrap and pop it in the fridge until our guest arrive for our lazy Sunday Italian lunch and guess what...dessert is done! I am now thinking after a successful and very easy Italian family lunch I should start teaching Sunday lunch classes- Italian style so you too can have a plate of tiramisu! A dessert chef? I am insanely jealous! Your tiramisu looks amazing. Maybe I can come to a class? Susie I seriously DO NOT think you would need to come to a class, however, I'd love to come and cook with you for sure! I do that all the time with recipes. I have a stack of notes on top of my printer that I thought I would remember or recognize but so often I find myself scratching my head when I look through them. I love tiramisu by the way this looks great! I knew you would Bryan...I just had this feeling lol!